Grandmother had one of those window seats you could lift up to find all sorts of treasure stacked within. That's how I came upon copies (first editions?) of Rafael Sabatini novels about pirates and buccaneers, a few of which were adapted for movies and so were familiar to me. Had my uncle read these in youth? There was a long ago when boys sought adventure in books rather than video games, to which I'll not condescend for investing childhood on James Bond and spacefolk. Point is those novels once mainlined fascination in open sea and freebooters who sailed (does anyone read likes of Sabatini other than academics under a microscope? --- and where/when was last time kids played pirate?). 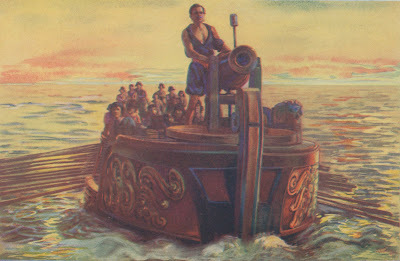 I'd like to identify what generation took with it desire to grow up and be Captain Kidd (some of us did get to engage piracy by becoming film collectors). 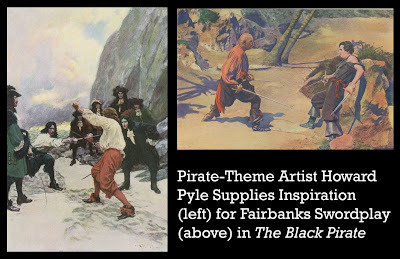 An illustrator named Howard Pyle drew for late 19th century mags and made a specialty of seagoing art. 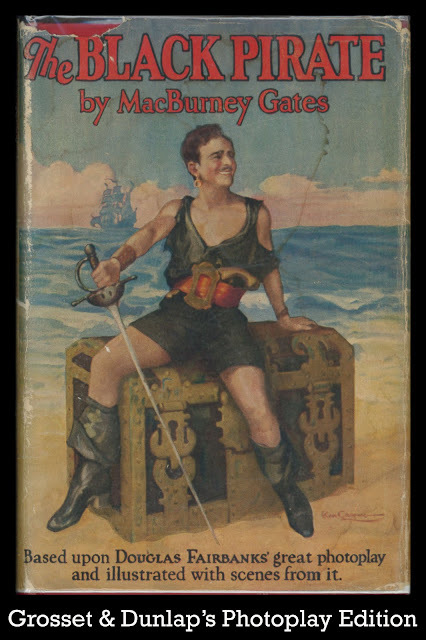 A book compilation of his best was Howard Pyle's Book Of Pirates, published in 1921, a copy making ways to child star Jackie Coogan, who'd show same to Doug Fairbanks and suggest he make a movie spun off blood-tipped images within. Then Boy King of Hollywood spoke years later of a sleepover at Doug and Mary's where The Black Pirate was conceived amidst DF horsing around and pillow fights with Mary, dawn finding Jackie in receipt of $10,000 for having presented the idea. This anecdote's a little precious to altogether believe, vanished era history as we'd like to envision it, but who's to say there's not truth there? 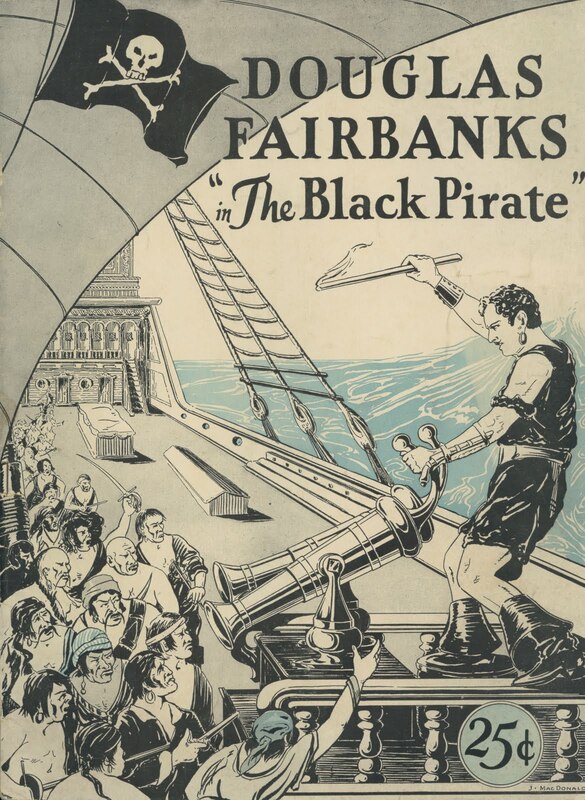 I can't imagine Fairbanks not thinking pirates from the moment he picked up Zorro's sword. As he played strongest to boys of America (nay, the world), what was fitter than taking inspiration from fan membership? We'll never know what a hero and role model DF was for followers now passed on behind him. I met a few who spent lives collecting Fairbanks, their devotion singular and unswerving from a 20's start. 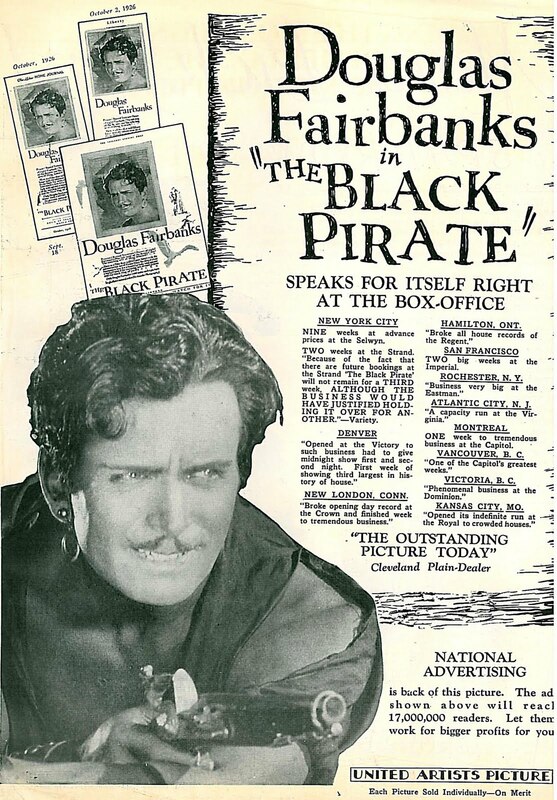 John Wayne was on continual lookout for Dougamabilia, and Burt Lancaster took cues from watching first-run Fairbanks that would illuminate his own Crimson Pirate. The last (as in final) fan cluster might have been generated by 8 and 16mm releases from Blackhawk Films, though I'd assume most of these were boys-to-men who'd come of spending age by time home editions made possible a go-back to when Doug's output was new. I first saw The Black Pirate via public library borrow of abridged 8mm and tried imagining currents running through forebear crowds. But how to duplicate pastel glories of its original two-color Technicolor? --- a version Blackhawk nor anyone else at the time had available. Two-color's odd look appeals to me more as samplings turn up on DVD, granted many not authentic to what folks saw back when. The Black Pirate was recently released on Blu-Ray by Kino. Theirs seems closest to original burnished look of the show. Two-color's named in recognition of fact it could register only so much of nature's palette. Red and green sort of come off, but yellow and blue are a nix. Fairbanks' knowing crew finagled impressions of missing hues and did so artfully. The Black Pirate has a pleasing look of tinted postcards I might have found elsewhere in Grandmother's cupboard. 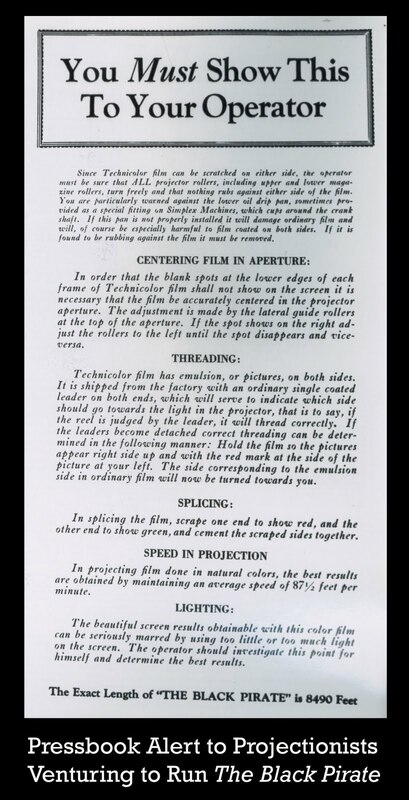 First-run prints were actually two strips of film cemented together in order to wed green with red and make the thing look something like natural color. Did a single copy finish its run unscathed? What United Artists got back from theatres must surely have been whacked beyond hope of repeat use. 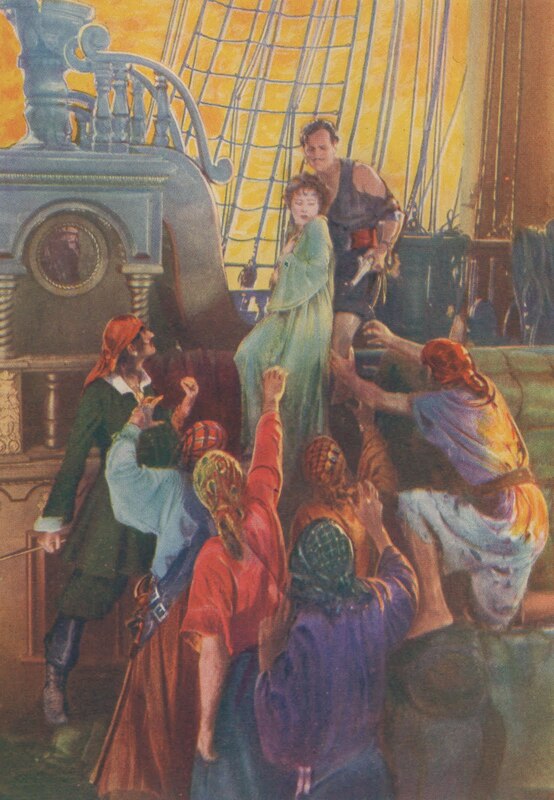 Technicolor had miles to go from March 1926 when The Black Pirate opened. Had its use been worth Doug's while in a long run? There was value in a public's knowing Fairbanks was on to something new. Others had tried color, but his embrace was assurance the process had arrived. 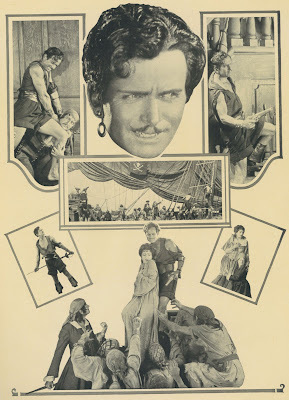 Grosset and Dunlap's Photoplay Edition enticed with "colored illustrations" promising a few more shades than The Black Pirate could deliver, but who'd carp so long as Doug was giving us a fresh sensation like this? (samples of G&D plates from the book here). The Black Pirate was a hit and well-remembered if not seen much after 20's play-off. Doug Jr. had notions of reissuing it to an early 50's market along with twenty-one other of his father's films then preserved by the Museum Of Modern Art (Fairbanks Senior donated the library to MOMA shortly before his death in 1939). Junior and venture partner Sol Lesser had first to buy out interests of widow Sylvia Fairbanks Gable and the daughters of Robert Fairbanks. The deal was wrapped in January 1952, Variety announcing that the films will be made available primarily for theatre distribution, although some of the minor ones may be sold for TV. More promising among the lot would be re-scored with commentary added. 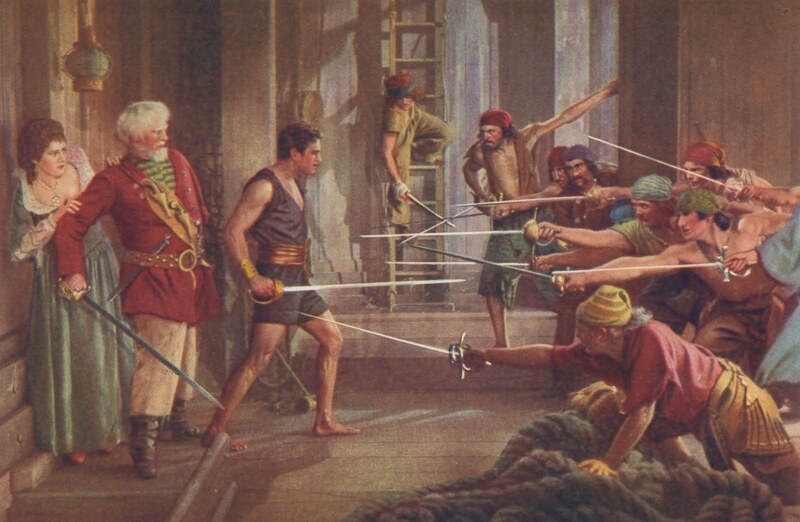 October '52 saw Fairbanks/Lesser's Odyssey Pictures announcing a theatrical reissue for seven, which included The Black Pirate. Within weeks, the number was shaved to six (Don Q, Son Of Zorro being dropped), with release set for an initial two in March 1953. 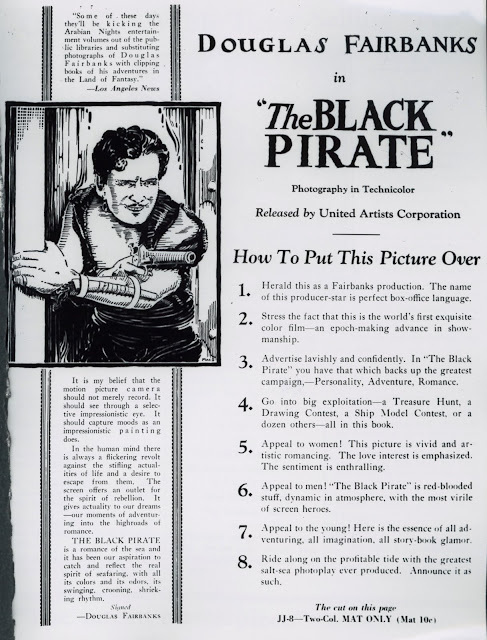 At this point, The Black Pirate was figured for black-and-white only. 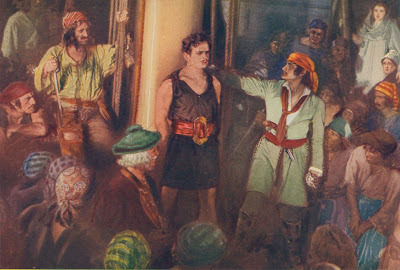 Odyssey tested a combo of The Iron Mask with Mr. Robinson Crusoe at a Modesto, California theatre. Scheduled for March, it went forward despite no deal set for national distribution. Robert Lippert's company stepped up to handle the pair in June 1953 with fresh campaigns in support of refurbished versions for which Douglas Fairbanks, Jr. supplied narration. Nothing, however, came of proposed reissues beyond Crusoe and Mask. I found no indication of The Black Pirate being back other than to non-theatrical venues. Same goes for others of the Fairbanks inventory. Just guessing, mind, but methinks Lippert laid eggs with Mask/Crusoe. In whatever event, by March 1955, Doug Jr. and Sol Lesser, doing business as Major Television Productions, Inc., announced syndication of four DF titles as part of an eighteen feature package (others mostly British pics Junior produced). The Black Pirate was there (in B/W) along with Mr. Robinson Crusoe, The Gaucho, and The Iron Mask. One footnote, kind of a sad one. Several Pirate photos above you'll notice are of the scalloped edge variety, once a popular means of giving images a vintage, if not distressed look, like old trunks had been opened and there they lay. To me, scalloped looks plain damaged. I use to come across them in dealer's rooms and wonder who'd been careless storing. Turns out lots of movie people retained these from shows they worked on and estates sold what survived to collectors. Keepsakes once property of W.S. 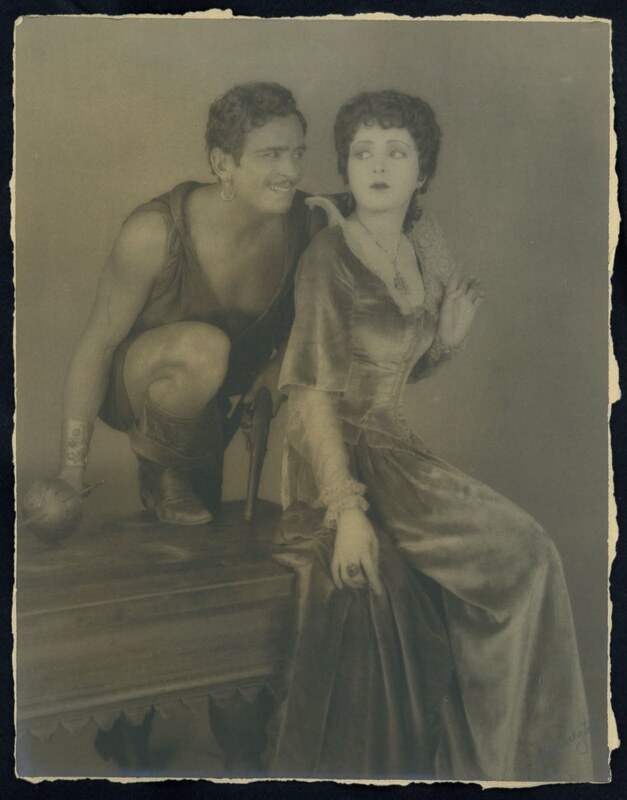 Van Dyke and Marion Davies surfaced like this. 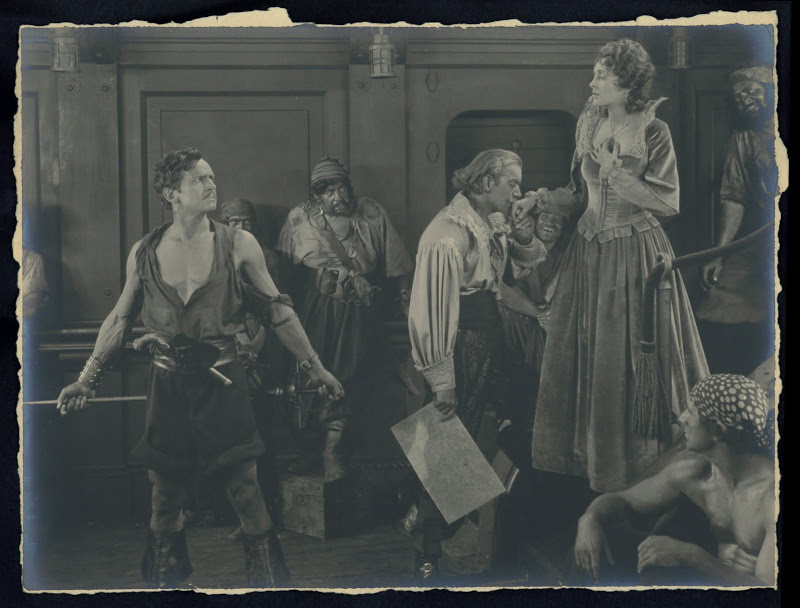 I ended up with Billie Dove's Black Pirate set, which interestingly contained only shots wherein she appears (what, no Sam De Grasse portraits?). I'd guess Ms. Dove had not family to care about and preserve these lovely scenes. A bleak lot of many celebrities is to finish alone. What Billie Dove treasured went to four winds, same as Lili Damita's stuff my friend Mike Mazzone found in a Disney World gift shop, of all places. Like Charlie Kane's sled tossed to the furnace, it all comes down to refuse sooner or later. I had a silent, single-reel Blackhawk Films version, which included bizarre commentary subtitles ("Top-heavy galleons like this one cost Spain its supremacy on the sea." "The swimmers were actually suspended from piano wire"). Now have the Kino DVD, which is great fun. Not sure if kids play pirates as such, but a couple of times lately I've come home to spot a couple of neighbor kids stalking each other with foam rubber battle axes and swords. At least no television monitors were involved. Kids certainly do still play pirate, thanks to Disney's Pirates of the Caribbean franchise -- movies hardly to my taste (to put it mildly), but they prove the fascination is still there. I have at least two great-nephews who have dressed as Capt. Jack Sparrow for Halloween, and PotC made them and their cousins (and parents!) warmly receptive to my 16mm print of The Black Swan (remember where that came from?). Moreover, here's at least one non-academic who still reads Rafael Sabatini for fun. His style (slightly archaic even in the 1920s) is still charming, and only Edgar Rice Burroughs can match him for exciting action scenes. 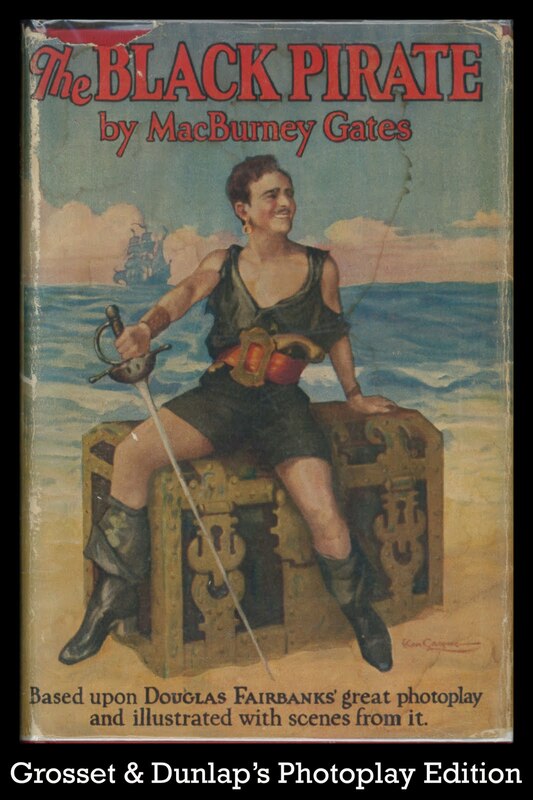 And finally, John, that Grosset & Dunlap edition of Black Pirate fairly makes my mouth water; really must save up and keep an eye peeled for my own copy (I'll put it on my shelf next to London After Midnight). I used to race in front of the TV when I heard the theme for The Hardy Boys-The Mystery Of The Applegate Treasure on The Mickey Mouse Club.I was a big pirate nut as a wee laddie.I used to think Ben Gunn from Treasure Island lived in a rotted out storm cellar,the only leftover from an old old house in the woods behind our home. 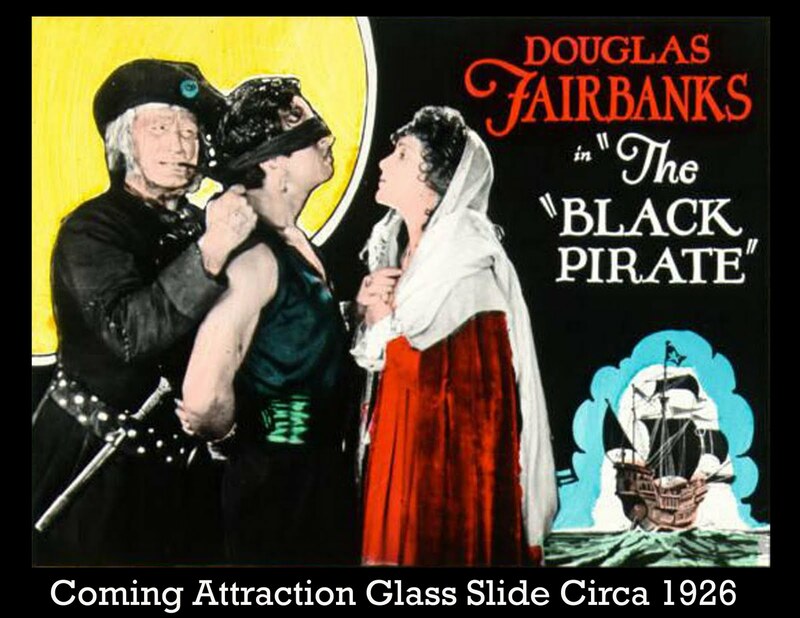 The Black Pirate is one of my favorite silents. Fairbanks come alive for me here. Thanks for another fine spread and quadruple thanks for turning me on to Jim Lane. As we all (or most of us do) know that Tod Browning's THE MARK OF THE VAMPIRE is a remake of LONDON AFTER MIDNIGHT I keep wondering why people say we can't really know the story. MARK OF THE VAMPIRE is a big let down for me. After all those impressive scenes we are told it's a fake. Ditto LONDON AFTER MIDNIGHT and THE BEAST WITH FOUR FINGERS. THE BLACK PIRATE, however, lives up to and surpasses my expectations. The revival of Fairbanks' film planed by his son and Lippert should have been in a first run house in New York with full orchestra and all the bells and whistles. Color me (no pun intended) a huge Fairbanks fan. Film Forum here in NYC ran a series of swashbucklers, including many of Fairbanks Sr. The biggest difference between Doug and his films and those of today is -- he seems to be happy and enjoying himself. His smile is infectious and his charm enormous. We saw Iron Mask with the Fairbanks Jr. voice-over, and it got much of the theater weepy. More Doug, please!